Empire Direct Salesman visited and was on several occasions rude, making jokes at my expense. Contrary to my better judgement, my wife liked the carpet, so we agreed price and I left my wife to take care of paperwork. Upon reviewing the contract that evening, there was an unexpected $200 dollar difference in price agreed, furthermore buried in the terms and conditions a "binding arbitration" clause. 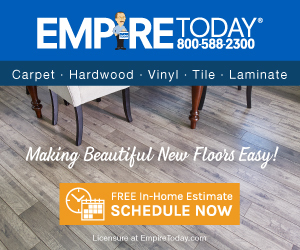 Out of principle, I cancelled the order next day and prior to writing my experience of Empire on this site, I gave their VP an opportunity to remedy the situation by removing the binding arbitration clause and honoring the original agree price. After speaking with a different local sales representative, I was expecting to hear back but never received a call back despite leaving messages. It took another email to a sales director to get a reply. What does this mean? In the event of a dispute your ONLY option is binding arbitration with Empire Today. Please "google" the term on Wiki - Binding arbitration was intended for internal commerce NOT to restrict consumer options in the event of a dispute. The lack of response from the local office is indicative of what you can expect dealing with Empire. Head office has higher expectations which are simply not met by the Atlanta local office. I consider myself to have had a lucky ESCAPE, clearly if the company was confident in its products, it would have no problem removing the binding arbitration clause. Review #176023 is a subjective opinion of mlevene.